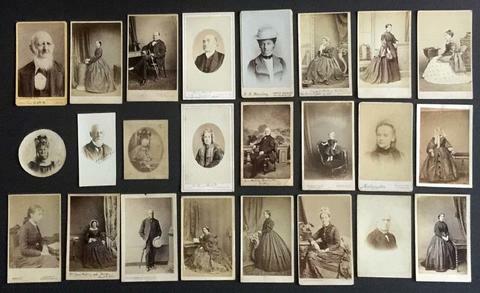 Photographs or calling cards of members of Newberry's extended family. Some are named on the back by Newberry with a note on genealogy. Includes photographs of: Newberry's mother Sarah Newberry, 1905; Newberry's Uncle F.J. Newberry; Newberry's Grandfather F.W. Newberry; Mrs Sarah Pine born Kenward (1790-? ); Mrs Thomas Kenward; William Munk; James Newberry (1781-); Elizabeth Newberry (1791-); Thomas Kenward (1788-); Mrs James Newberry born Dixy. Also includes receipt for 12 calling cards, 1867.